Anna Regina’s Secondary Camecia De LaCruz is fifth this year with 17 Ones, 2 Twos and 1 Three. 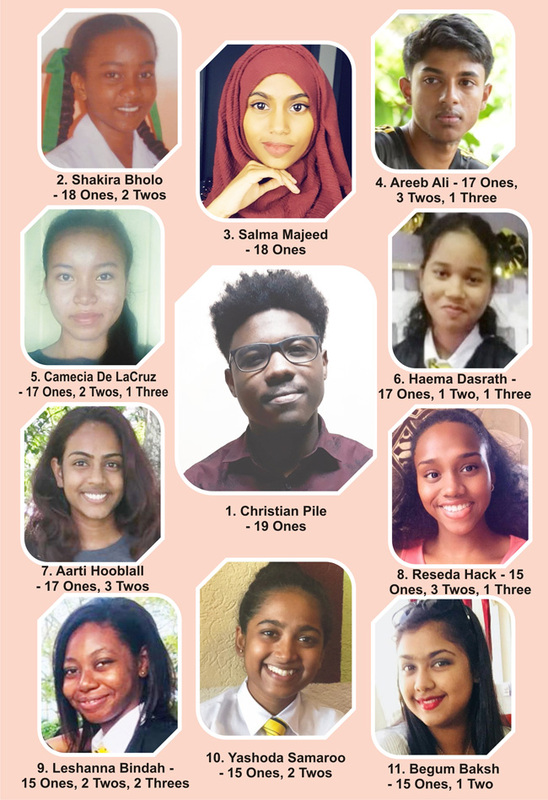 The sixth, seventh, eighth, ninth and 10th places all went to QC students Haema Dasrath [17 Ones, 1 Two and 1 Three]; Aarti Hooblall [17 Ones and 3 Twos]; Reseda Hack [15 Ones, 3 Twos and 1 Three]; Leshanna Bindah [15 Ones, 2 Twos and 2 Three] and Yashoda Samaroo [15 Ones and 2 Twos]. In fact, unlike the past few years when the Ministry invited a number of the top performing students to share the spotlight as the results were announced, this year the auditorium of the National Centre for Educational Resource Development [NCERD] was mainly filled with education officials and members of the media eager to hear the results announcement. “What is even more important, we recognize that all of our children are gifted, regardless of wherever they are born, whoever their parents might be or where they come from. They are gifted, and therefore we have a responsibility to tap into that giftedness and to ensure that our children perform, with respect to applying the right kind of methodologies as it relates to teaching and learning,” Hutson said. He also shared his conviction that more staffers within the education sector are becoming more passionate in understanding how they ought to function. This, he said, is being done in the context of collaboration with teachers. “Collaboration is a watchword in the Ministry of Education…with our teachers, our students, our parents who have been working assiduously and energetically to ensure that there is movement in the sector and that our children receive the best possible education that they could receive,” said Hutson, as he also stressed the importance of perseverance. “I think we are learning to persevere and we are learning not to give up. We are not going to fool ourselves; we are nowhere where we want to be as an education sector, but I think that systems are in place to ensure that we get where we want to be,” said Hutson. As she congratulated the students that have been able to matriculate this year, the Education Minister revealed that a total of 12,269 candidates registered for CSEC this year, a decrease from the 12,684 who were registered last year. She disclosed too that an analysis of the results show that 69.1 percent obtained grades one to three passes, an improvement of eight percent from 2017. “We saw a number of improved performances,” said Minister Henry, as she alluded to improved grades one to three passes in both English A and English B. This year saw English A recording a pass rate of 67.14 percent comparable to 57.99 percent in 2017. In the area of English B, there was a 78.6 percent as compared to 44.45 percent in 2017. Mathematics saw an improvement with a pass rate of 43.39 percent this year as compared to 39.23 percent in 2017. Additional Mathematics on the other hand, remained constant with a pass rate of 68.45 percent. Last year the pass rate was 68.61 percent in 2017. Following the announcement of the results yesterday this publication sought to reach out to a number of the top performers, many of whom are currently enjoying their summer vacation. CHRISTIAN PILE – 19 Grade onesWith his 19 grade ones, 16-year-old Christian Pile, of D’Urban Backlands, has again claimed the top performer place for QC. He disclosed that although his initial plan was to undertake 16 subjects the encouragement of his mother, a former teacher, saw him challenging himself to do three more. In addition to the support of his parents [FayAnn and Nigel Pile], Pile credits his success to the support he got from both his class and lesson teachers, classmates and the Almighty Creator.Come September, Pile hopes to commence Sixth Form at QC as he decides on the career path he will eventually follow. Seventeen-year-old Shakira Bholo, a student of Anna Regina Secondary, said that she is most grateful to God for her outstanding performance. The Cotton Field, Essequibo Coast resident also spoke of the support from her parents. “They supported me financially, morally and most of all emotionally,” said Bholo, who aspires to one day become an economist. While Majeed, who resides in Queenstown, Georgetown, hopes to one day become a lawyer and humanitarian, for now her plan is to head to Sixth Form. The brother of CAPE top performer and a former CSEC top performer too, Aadilah, Ali is hoping to follow in his sister’s path to continue at QC to complete CAPE. He too credits his success to Allah, his teachers, parents and his sister, and all those other persons who backed in one way or another. Camecia De Lacruz who hails from Anna Regina, said that she owes her accomplishment to her parents, whom she said have been very supportive and catered to her every need. Although the Anna Regina Secondary School student had hoped to do much better, she expressed appreciation for the support she gained from other relatives, her teachers, classmates and siblings. As she looks to the future, she hopes to one day enter the medical field by becoming a surgeon, oncologist or an obstetrician. “I dedicated myself to my work,” confided Heama Dasrath, as she revealed that there were days that she did not have the confidence that she would have excelled in all of the subject areas she wrote. She however said that she challenged herself to do her best, but admitted, “when I saw my results, it was a shocker.” This 17-year-old Ruby, East Bank Essequibo girl, credits her success to family support and the commitment of her teachers. With her good grades in hand, Dasrath hopes to be accepted at a university overseas where she intends to pursue studies in Law. “I hope to maybe one day become a Prosecuting Attorney,” she said. Happy with her results, 16-year-old QC student, Aarti Hooblall of Annandale, East Coast Demerara is ready to continue at QC at the Sixth Form level. In an invited comment to this publication, Hooblall said that her success was due in part to her dedication to her studies and the support she got from her parents, especially her mother, and her teachers. Hack, who made Meadow Brook, Georgetown, her adopted home, said that she is especially grateful for her achievement. Not only were her parents a main source of support, but her teachers and friends were as well. She hopes to continue at QC with the hope of pursuing an Associated Degree in Natural Sciences. Although Leshanna Bindah of Newtown, Georgetown had her heart set on claiming the top position at the CSEC exams this year, she nevertheless said that she was proud of her accomplishment. “I thank those who worked tirelessly with me throughout the stressful period,” said the 17-year-old QC student. She was especially eager to thank several family members and teachers as well as some of her friends. As she heads to Sixth Form, Bindah said that she one day aspires to become a Psychologist, Fashion Designer and a model. Sixteen-year-old Yashoda Samaroo certainly was not expecting what she was able to achieve at CSEC. But she is pleased that she got the necessary support to come out on top. This QC student from Lusignan, East Coast Demerara, is especially thankful to her parents, siblings and teachers, and God, too, for helping her along. She plans to head to the University of Guyana where she will pursue studies in Law. As she contemplates her career path, 17-year-old Begum Baksh is basking in the glory of her CSEC achievement. The Anna Regina Secondary student, who hails from Sparta Dam, Essequibo Coast, said that she is proud. She like the other top performers insisted that she could not have excelled had it not been for some key supporters in her life including her parents and, of course, teachers. Although the top performer has a passion for Geography and Mathematics, she said that while she once dreamt of becoming a lawyer, she is yet to decide on a career pursuit.